VSU Degree 1st, 3rd, 5th Sem Time Tables 2018: Vikrama Simhapuri University (VSU) rolled out the time tables for Degree October/November Exams for 1st, 3rd and 5th semesters and 1st, 2nd, 3rd Years. 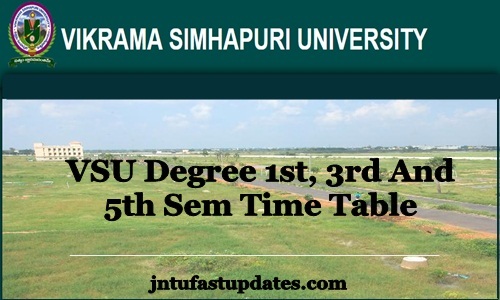 Aspirants obtaining the graduate degree from VSU can check the date sheet from its official portal, simhapuriuniv.ac.in. The VSU UG (CBCS) Degree October/November 2018 Date sheet For 1st, 3rd, 5th Sem and 1st, 2nd, 3rd Year wise is now accessible to download. Aspirants can soon proceed to check the time table and can take the printout of it for later reference. The download link and printout options will be provided at the official PDF link. Students who are going to attend the VSU Degree Odd semester examinations can check more details from the following article. Vikrama Simhapuri University (VSU) is one of the known universities of Andhra Pradesh. The VSU was situated in Nellore and functioning since 2008. It offers various Graduate Degree, Postgraduate Degree courses for students. Also, various specializations offered by the VSU. Overall 127 colleges of UG, PG, MBA, MCA, B.Ed and various other specialized institutions affiliated to VSU. The university follows Choice Based Credit System (CBCS) for students. In this, students can select their preferred courses in their UG/PG degree. Also, the university conducts the examinations yearly twice; once in March/April months and once in October/November months. At present, the university is ahead to conduct the odd semester examinations for the students of Graduate Degree. Aspirants undergoing the graduate degree of BA, B.COM, BSC can download the CBCS 1st sem, 3rd sem, and 5th sem time table and can observe the exam dates from it. By clearly knowing of the exam dates, aspirants can get the clarity about the exam schedule and they can prepare well. Students who are pursuing odd semesters in VSU can now get the time table from its official portal, simhapuriuniv.ac.in as it is presently accessible to download. Here we have given the direct link to download the date sheet at below. On the homepage, the examination schedule links will be displayed. Select the course, sem, and download the corresponding time table.